What Senses Do Snakes Use to Catch Their Prey? Snakes have developed a number of specialized sensory tools in capturing and hunting their prey. Though they are admittedly disadvantaged in the limb department, snakes still manage to be incredibly efficient hunters; their finely-honed senses are invaluable in their biological success. Different species of snakes have evolved specific senses that allow them to thrive in vastly different environments, from the desert floor to rainforest canopies. Snakes do not hear sounds like we do, but they are able to pick up and interpret vibrations in a similar way that we pick up and interpret sound waves. Snakes lack an outer ear but have all the workings of an inner ear, including a cochlea. Movement from potential prey animals cause vibrations on the ground that are transmitted through the snake's jawbone. Vibrations allow snakes to "hear" movement and identify the prey's location. Though it may seem more like a superpower than a sense, some snakes known as pit vipers can detect prey based on thermal signatures. These snakes have specialized heat pits on their head that are sensitive to changes in heat in their environments. The pits allow them to hone in on an animal's body heat, even in complete darkness. 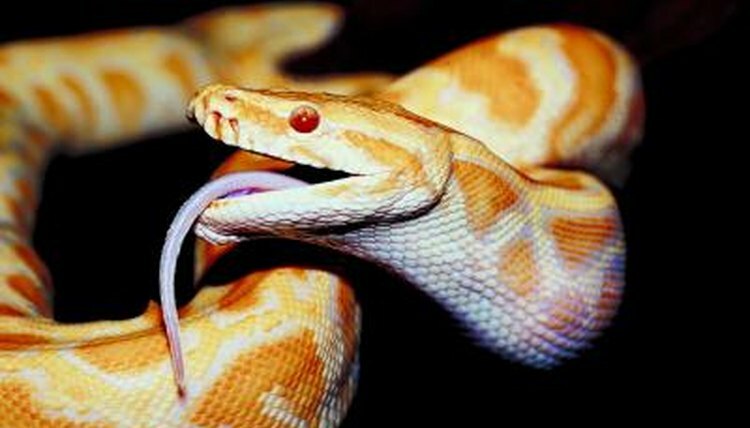 Other snakes, such as boas and pythons, have small multiple pits located under the scales of their lips that are sensitive to changes in temperature as well. Snakes receive information about their surroundings by interpreting chemical signals given off by potential prey. Snakes are able to "smell" their prey by picking up chemical information with their tongues. When a snake flicks its tongue in and out, it can detect its prey's scent trail. Chemical detection is one of the first steps snakes employ in locating prey. Because snakes are generally ground-dwellers, they do not need finely honed distance vision. However, tree snakes possess sharp eyesight and horizontal pupils that extend their forward field of vision. Though the eyesight of snakes in general does not compare favorably to humans, they have an amazing ability to detect movement of their prey. This movement detection makes up for any deficits in distance or color perception. How Do Cobras Defend Themselves? How Strong Are the Coils of a Boa Constrictor? How Do Snakes Hear Without Ears? What Are the Nostrils on Snakes For? How Often Do Rattlesnakes Sleep? What Heat-Sensing Organs Are Used by Some Snakes? Can Snakes Tell People Apart? Can Snake Tongues Be Different Colors? What Organs Do Snakes Use to Smell? Do Rats Have Good Eyesight? Why Do Snakes Flick Their Tongues?